We should never have given up this trusty device, which even a dummy could operate without passwords. One way to drive normal people over the edge is to have them buy a new computer. Nothing works like on the old one, and likely as not the old one has been trashed in the process of copying some of its content. And then, when you look under the hood, not only does the transmission not work but the motor has disappeared. Meanwhile, though, you have filled out one registration after another, with the result that half the population of China and India now has access to your personal information. Don’t worry about it, though, for you have their guarantee that your data will be used only in 27 different ways, all to make sure you get the ads that suit the way you live. Computers and the Internet have made the entire world subject to new kinds of crime, not to mention making it easier for the barbarians of ISIS to recruit members and freely communicate around the world. This combination of technology also killed manual labor, making a few people rich and condemning a big part of humanity to servitude and dependency. Oh yeah, it has also abolished civility in pubic discourse and given every ignorant loudmouth a way to make himself heard without being held responsible. I too miss the old days as well Hasso. We have an old electric typewriter in our house which is used by my 10 year old for fun. I plan on using it more when I retire in a few years. It’s an anachronism, but they are still in use today. I suspect an old newsman like you has one as well. A bit of nice irony — this article — written on a computer, read on a computer, and lamenting the rise of computers. Tongue planted firmly in cheek, ehhh??? Still have the Remington monster I picked up 50ish years back. It was surplus from BPA. (Old enough to have a 6-character Portland phone number for the vendor). True, and what is even more unfortunate is how the average skill level of educational accomplishment seems to be dropping, even though the addition of computers should enhance learning. Or, at least, computers would our learning if the software and its usage was done properly. One thing that networked computers should be good at is improving the effectiveness of democracy and democratic representation. Alas, our Republic is not a Democracy. And history teaches us that technological advancement oftentimes means turmoil. I viewed a report that Vlad Putin some time ago ordered his intelligence services to use typewriters and not internet/computers. As anyone who served during the Cold War years knows hard-copy secrecy is very difficult and inconvenient. 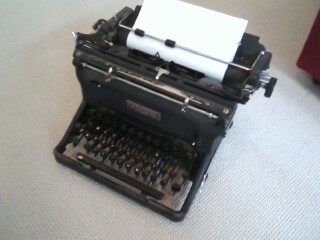 Ignoring the human vulnerabilities, the technological vulnerabilities of typewriters are well known. Key taps can be intercepted and deciphered from a distance. Hidden cameras can watch you type. Typewriters can be bugged. When it comes to technology, there is no such thing as absolute security. I’ll take my chances on modern technology providing the best form of protection. Everything you said about the cold war years is true about current technology in spades. Some of us would rather NOT trade security for convenience.